Pecan pie is one of my favorite desserts, but this year, my goal was to create a recipe presenting a new take on a classic. I decided to make a version that uses a salted caramel instead of a maple syrup base. It’s also baked upside down in an iron skillet. I’m of the belief that all things cooked in an iron skillet turn out better. With the holidays just around the corner, this pecan pie recipe is one worth trying. It’s sure to be a hit because of the salty/sweet balance. 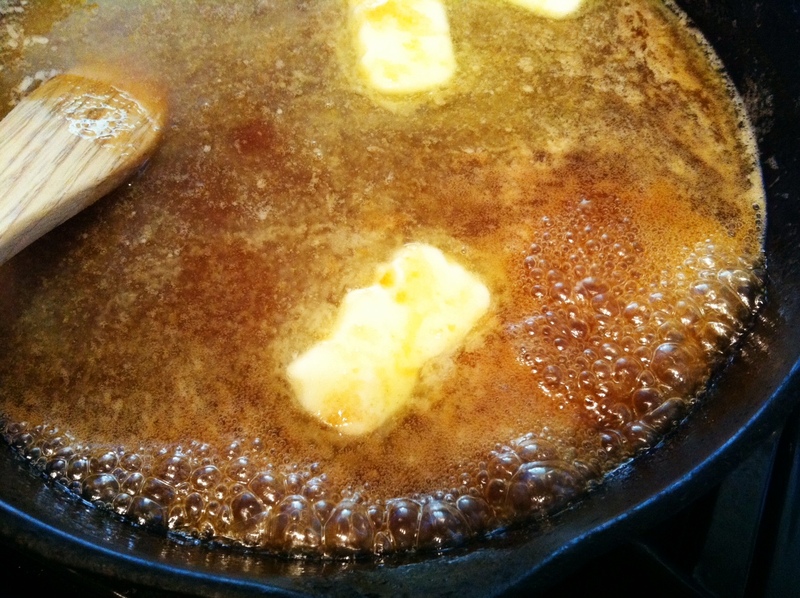 In a 10-inch iron skillet over medium heat, melt butter, honey and sugars. Bring to a boil and boil for 4 minutes. Add in pecans and heavy cream and boil 3 more minutes. Remove from heat and set aside. Let cool about 30 minutes. 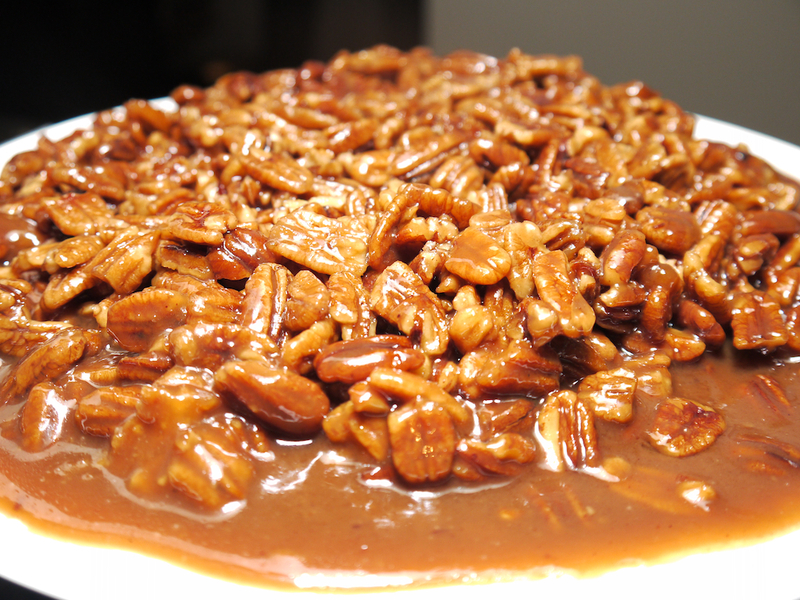 Using a wooden spoon, mound pecans and caramel slightly in center of skillet, leaving space between pecans and edge of skillet. Preheat oven to 425F and place rack in the top third of oven. Roll out pie crust into a 13-inch circle. Place the crust over the skillet, tucking the dough down against the edge of the skillet and around the pecans. Place two baking sheets, one of top of the other, underneath the skillet to catch drippings while pie is baking. Place skillet in the oven and bake until dough is just turning golden brown (about 10 minutes. 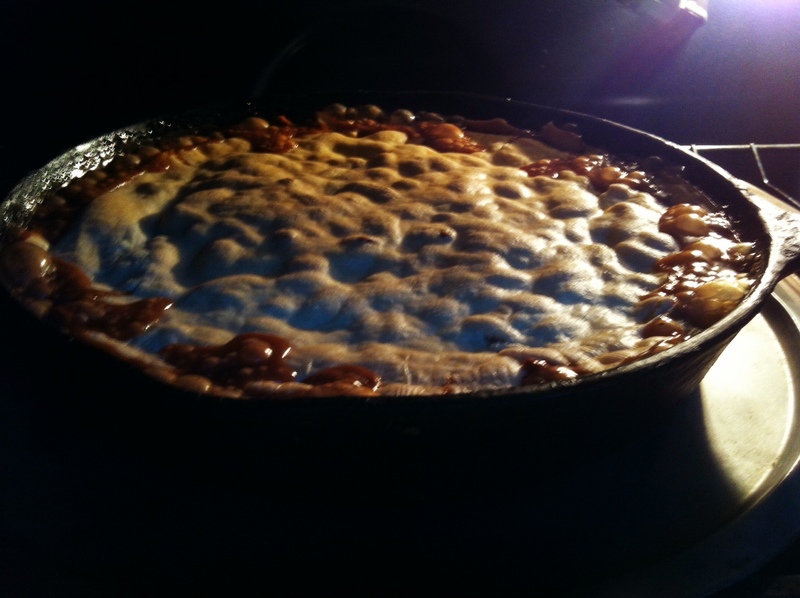 Reduce oven temp to 350F and continue baking until pie crust is cooked and the caramel is bubbling around the edges of the skillet (about 30 minutes). Remove the pie from the oven and let cool about 20 minutes. Carefully invert the pie onto a parchment-lined tray, baking sheet or directly on to serving plate. Do not invert into a pie dish, you should invert the pie onto a flat surface. If the pie does not release easily, heat the skillet over medium heat for about 30 seconds. You can always adjust the salt of this dish if you want something sweeter. I’m a big fan of salty/sweet dishes and this pie is the perfect blend. Especially, with the salty/sweet of the caramel pairing with the nuttiness and butteriness of the pecans. Make this pie to wow your guests on Turkey Day. Lunda delicious! I’m def going to try this. This sounds amazing! I adore pecan pie and salted caramel but it would never have dawned on me to put them together. I love both so it dawned on me when browsing pecan pie recipes. This is NOT for those dieting or watching your weight….or wanting a healthy heart!! BUT…it is for me. Thank you “Po’ Boy Livin Rich”.